One of the most interesting if not controversial aspects of the PC gaming culture is the method one takes to cooling their components. As much a measurement of one’s craft as it is a machine built for the purposes of visual and audio entertainment, the entire process of choosing the components, assembling the system, and tweaking it to each individual’s preferences all hold equal importance amongst one another. Where the decision of a graphics card, CPU or RAM kit will have the most affect on performance, others such as the chassis, motherboard and method of cooling will adhere more to the capabilities, limitations and visual styling of the system. This begs the question – Which method of cooling yields better performance from the system – let alone additional choices for styling? 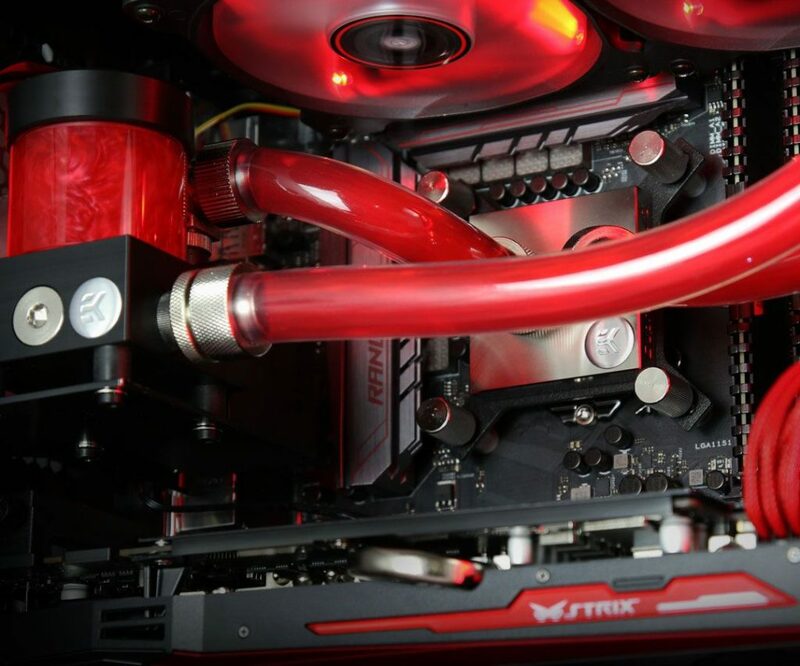 Is air cooling the way forward or should gamers adopt a liquid cooling setup? First of all, let’s take a look to how each cooling method works inside the system. Consisting of a metal heatsink usually constructed from copper or nickel which sits directly on top of the CPU through a mounting solution, this plate of metal absorbs heat from the processor by the means of thermal paste, before moving the heat through a series of pipes and fins which are treated to an intake of fresh air thanks to one or two fans. These types of coolers can be constructed in a manner that’s horizontal to the motherboard, which is great for console-like form-factors, along with the most traditional of air coolers retaining a vertical alignment reminiscent of a vehicle’s engine. Some coolers may even adopt two or three fans with multiple heat-sink arrays for superior cooling and greater concentration for air intake. While those such as the Cooler Master Hyper 212 or the bequiet! Pure Rock take a simple approach to cooling with a single 120mm fan and x4 6mm heatpipes for optimal performance and amazing silence, others go above and beyond factoring in styling an uncompromised levels of performance for incredibly low temperatures. Proving to be one of the best air coolers available, often surpassing the Mid-range all-in-one liquid coolers – going toe to toe with those on the High-end – the Noctua NH-D15 is commonly regarded as one of the most premium coolers. 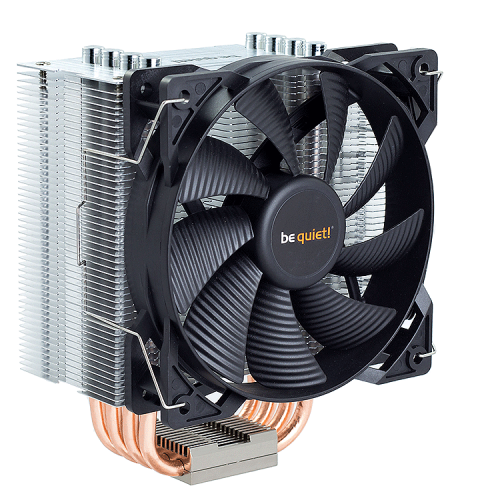 Consisting of x2 140mm fans with dynamic speed control, the cooler makes use of x6 copper heat pipes and aluminium cooling fins divided across a dual heat sink design for a total of x12 heat pipes and a nickel plated finish. Emphasizing both style and performance for a visual presentation that’s certainly going to attract gamers and by passers alike, the Cooler Master V8 GTS adopts LED lights and a mechanized shroud that’s both aggressive and appealing – fit for any type of chassis. Where air coolers hold their negative traits resides within the many types of mounting kits that’s specific to each brand or product, as well as the level of silence that can be achieved in regards to the amount of cooling performance its fans will be able to deliver. There’s also the issue of clearance where the height of the system’s RAM modules could interfere with the cooler, as well as the profile of the chassis, which as said previously, can be mitigated by the use of low-profile air coolers. Allowing for near endless possibilities for fan mounting solutions, the benefits of an air cooler giving owners the choice for personal styling and performance levels simply by switching over to a new fan means the cooler will most likely outlive a liquid cooler, since the heat sink itself doesn’t contain any moving parts. Taking the time and effort away from the installation of custom liquid cooling setups, an all-in-one cooler has a very simple premise and design in order to deliver equal or close-to levels of cooling performance as a true custom loop. 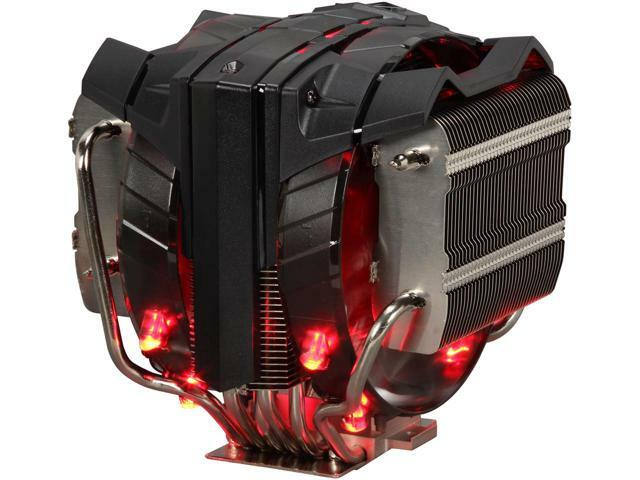 An all-in-one cooler combines the pump and heatsink which would be separated in a custom loop, and combines the two into a single piece which mounts to the socket of the CPU. This is then followed by a set of tubes which allows liquid to flow towards a closed-off radiator cooled by the means of a fan, before cycling back down to the heatsink for the dissipation of upcoming heat. As the cooler is completely closed off with no options for refilling – with certain exceptions to specific products – the cooler requires no maintenance or aftercare from the owner. Available in size configurations that allow for both both single and dual 120mm and 140mm fans, those looking for additional performance or silence will able to do so. 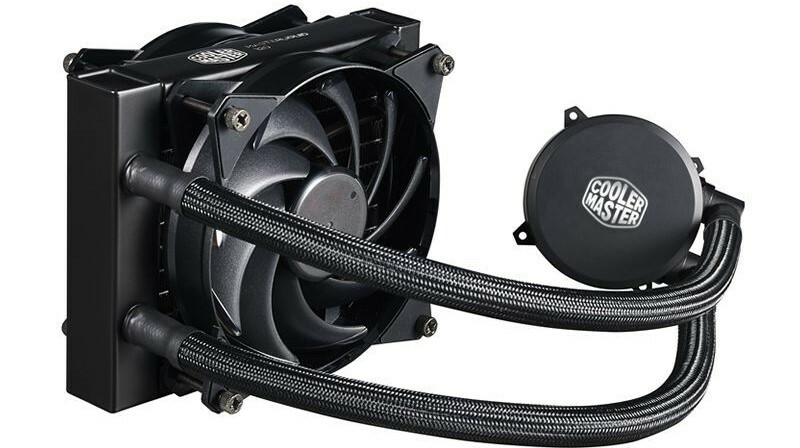 Along with choices for RGB styling and interchangeable fans just like traditional air coolers, AIO, also provide options for tubing such as flex and braided in both thick and thin varieties. This can be seen with those such as the Corsair H100i v2 with its 240mm radiator, as well as the Cooler Master Master Liquid 120 with its sleeved tubing. As the radiators of an AIO require additional room for installation on the chassis, those looking to implement this type of cooling will have to make sure they have the necessary clearance to do so. As the primary means for cooling is to move heat through liquid to then be expelled by the means of a fan and radiator, the fans can usually be spun at lower speeds than to that of an air cooler, since the radiator itself will be positioned at the vents of the chassis. As the most comprehensive cooling solution of all those featured, custom loops require the most time, preparation, attention and effort in order to correctly install for the best possible results. Unlike air coolers which commonly consist of a few screws, bolts and mounting plates in order to attach the heatsink, or even AIOs which usually require the same if not a similar setup, liquid coolers demand a greater amount of care and focus when it comes to assembly given the incredible number of parts. Consisting of fittings, tubes, a pump, radiator, reservoir and fans, options for extenders and adapters which allow easier maneuverability at angles for the management of tubing – this means a great deal more of involvement and decision making from those brave enough to forego a custom loop will be required. While the setup can be quite simple for a single loop, when looking to add extra hardware to the setup such as graphics cards or RAM, more attention will be needed as well as extra care in order to make sure the support is present for the correct GPU mounting solutions. Working much the same way as an AIO cooler, liquid flows from the reservoir by the means of a pump which is then carried through a tube to the mounting plate of the CPU or GPU, continuing its course to the radiator where heat is then expelled by a fan. This flows back to the reservoir where it is ready to continue its loop. As this setup requires maintenance every 7 months to a year on average where it’s highly recommended to drain and refill the loop with fresh water, most would agree that the small amount of time and dedication is worth the aesthetic styling and performance that the custom loop offers, and with that being said isn’t necessarily a bad thing. 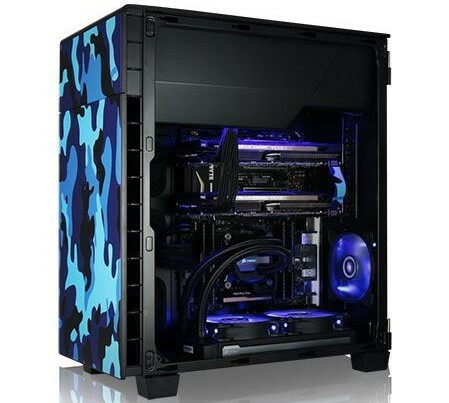 Proving to be the most attractive of all three solutions, the many options for hard-tubing and soft-tubing setups with different colours of dye and mounting kits allows for an untold number of configurations each unique and personal to the owner of the system. As this type of cooling requires the need for filling and draining there are possibilities for leaking. Since the construction and quality of water cooling technology has greatly advanced, the chances of leaks and spillages are incredibly low, so long as the user has followed the instructions correctly. While custom liquid setups will yield the best results when attempting to reach a balance between temperatures and noise from the system it is the most demanding. Proven to be as good as all-in-one configurations while being only a touch more expensive in order to reach the same level of performance, air coolers are great for longevity and reliability. Reaching acceptable levels of cooling performance to that of a custom loop setup, all-in-one coolers may not be as customizable but they do provide ease of use and simpler installation than any other choice of cooling. 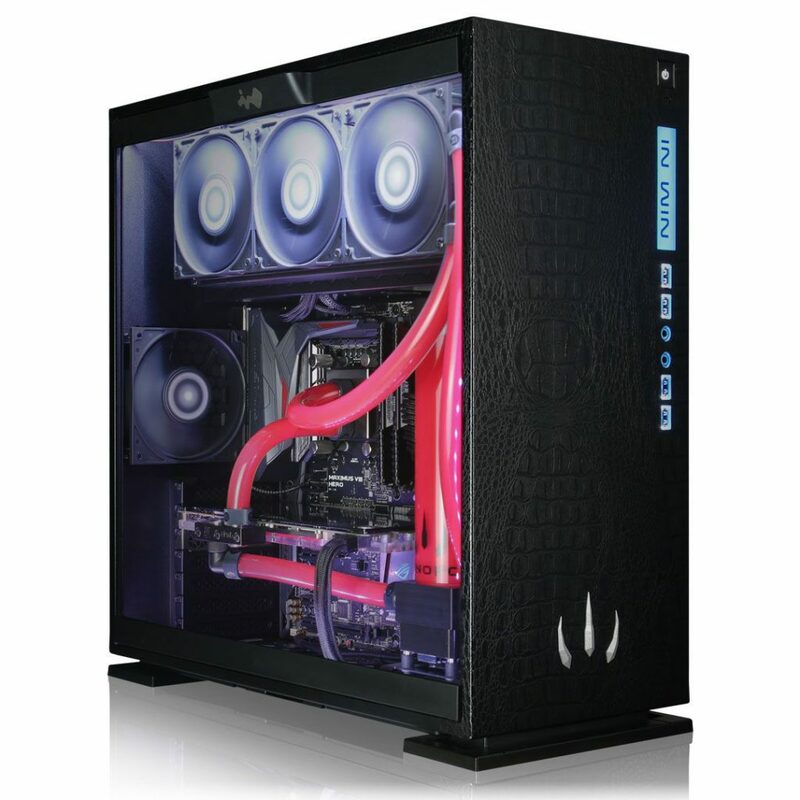 For a great selection of air coolers and liquid coolers, check out cooling section at Dino PC. Next Post:Dino PC Returns To WeGeek!